This building, close to Holyhead cenotaph, was once part of the Eagle and Child Inn. Later it was used as private homes, and one of the occupants was John Fox Russell (pictured right). 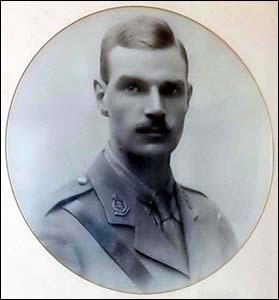 He became an army medic and was awarded the Military Cross for his courage in collecting wounded men for treatment during the First Battle of Gaza in March 1917. He showed equal valour in Palestine in November 1917, ignoring fire from machine guns and snipers to bring in fallen soldiers. Eventually he was hit and killed. He was awarded the Victoria Cross, Britain’s highest military honour for bravery. The Eagle and Child Inn was built c.1770 on part of the Stanley family’s estate. The name derives from the family’s coat of arms. It was the starting point of coaches to London. In 1809, the journey on the daily Royal Mail coach via Chester took 48 hours. The terminus at the southern end was the Swan with Two Necks Inn, in Gresham Street. By 1828, the journey was reduced to a little over 29 hours, thanks to the new road (now the A5) engineered by Thomas Telford. Completion of the railway from Chester transformed long-distance travel, and the Chester & Holyhead Railway bought the Eagle and Child in 1850. The building was renamed the Royal Hotel after King George IV visited in 1821. It was replaced with the Station Hotel in 1880. The old hotel then became residences. The main central section and one of the wings have long since been demolished, leaving only the northern wing. It has been home to the same solicitors’ practice – now TR Evans, Hughes & Co – for well over a century.